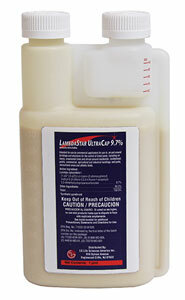 New from LG Life Sciences and Rockwell Labs Ltd, LambdaStar UltraCap 9.7% is a capsule suspension formulation designed to protect the active ingredient lambda cyhalothrin from the weather elements, providing up to 90 days of residual control. It’s labeled for use indoors, including food areas, and outdoors, including structural, turf and ornamental, as well as livestock housing sites. The product features a Caution signal word and dramatically reduced potential for user irritation compared to some other lambda products. It is available in 16-oz. squeeze-n-measure bottles.